Pavement profile or smoothness has been identified nationally as a good measure of highway user satisfaction. This has led highway engineers to measure profiles of both operating and new highways. Operational highway profiles are often measured with high-speed inertial profilers. New highway profiles are usually measured with profilographs in order to establish incentives or disincentives for pavement construction. In most cases, these two processes do not measure the same value from the ?cradle to grave? life of pavements. In an attempt to correct the inconsistency between measuring techniques, lightweight profilers intended to produce values to be used for construction acceptance are being made that measure the same profile as high-speed inertial profilers. Currently, two profiler systems have been identified that can measure pavement profile during construction. This research has produced a field evaluation of the two systems. The profilers evaluated in this study are able to detect roughness in the final profile, including localized roughness and roughness at joints. Dowel basket ripple is a significant source of pavement surface roughness. The profilers evaluated in this study are able to detect dowel basket ripple with enough clarity to warn the paving crew. String-line disturbances degrade smoothness. 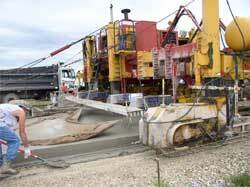 The profilers evaluated in this study are able to detect some string-line disturbances during paving operations. The profilers evaluated in this study are not currently able to produce the same absolute International Roughness Index (IRI) values on the plastic concrete that can be measured by inertial profilers on the hardened concrete. Construction application guidelines are provided.